Welcome to May! Hope this post finds you doing extraordinarily well. This quote ties directly into the Maxim as many folks don’t make the most of the way things turns out, instead focusing on and complaining about what is missing and/or wrong with the situation. This is a lesson I personally lived out in my professional selling efforts. When I started in business management consulting sales, I was assigned a territory that was considered to be “saturated”, having gone through many years with many different sales reps before me calling on what was, by and large, the same prospective client base. At the same time, there were brand new “virgin” territories in other areas of the Eastern U.S. that afforded the sales reps there opportunities to get in front of potential clients for the very first time. In a new territory, it was not uncommon for the salesperson who worked there to receive (from the company’s inside sales effort) twice the number of appointments in any given week. It would have been quite easy to focus on those negatives; I can’t sell because the territory is saturated, I can’t sell because the prospects I’m seeing have seen us 14 times already, I can’t sell because I’m getting half the appointments, etc. Over my 10 years with the company, I maintained the highest batting average (sales to presentation ratio) and ended my tenure with the highest generated revenue totals in the company’s history. 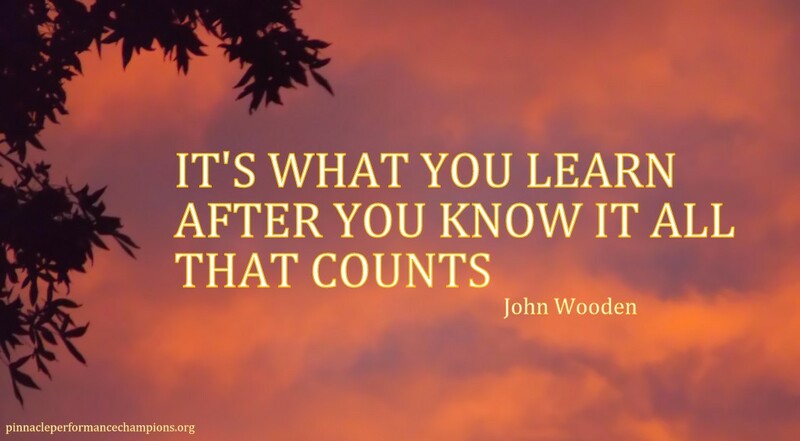 Time marches on and with it we have arrived at the next John Wooden Maxim: It’s what you learn after you know it all that counts. This popular Wooden maxim is the first quote I reference with new trainees. While select students are novice, inexperienced lads and ladies, most folks enter training with at least several years of experience, up to seasoned veterans with 10+ years on-the-job. Many of these experienced folks enter new training with a know it all already mentality, seemingly close-minded to new ideas. Obviously this is not the most favorable attitude when it comes to learning anything. Fortunately, the vast majority of participants in my Pinnacle Performance training do come around. Usually at some point during our first time together they realize they actually didn’t know this or that and, now that they do, they’re better for it. 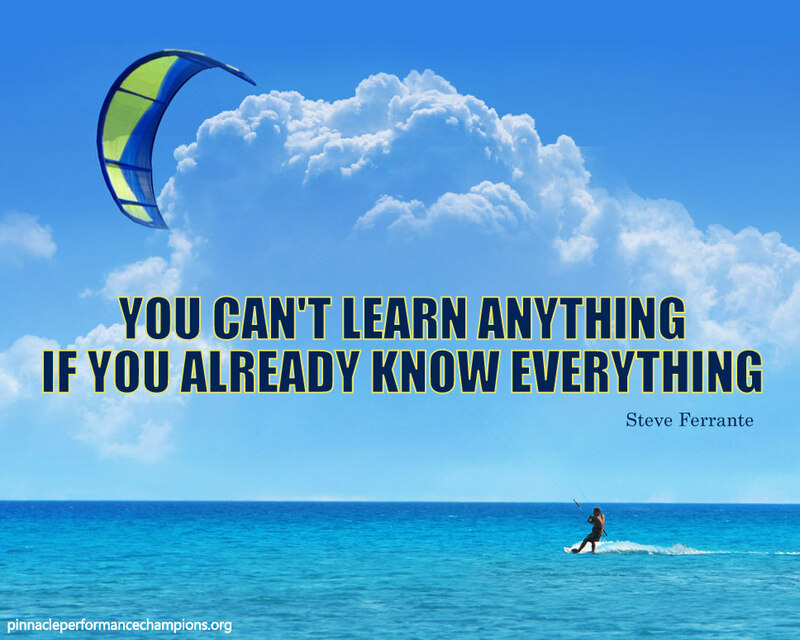 The reality is you can’t learn anything if you already know everything. Those know it all types aren’t particularly interested in moving forward and growing, contending that if they don’t know it by now then they never will. 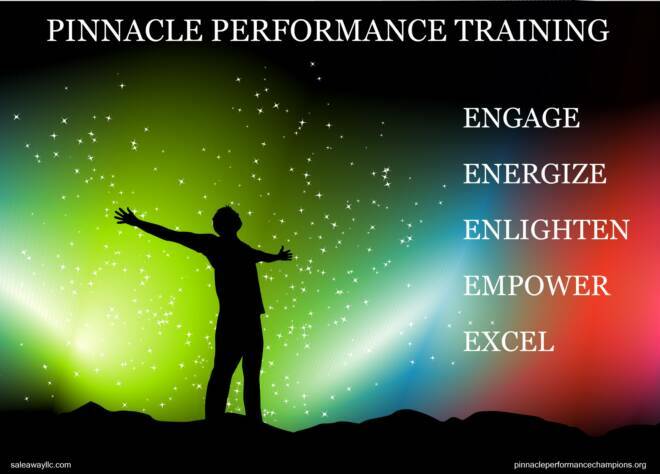 Pinnacle Performers maintain an open-mind and pro-actively seek out new learning opportunities and ideas that can help them further their skill set and performance. This next John Wooden MAXIM is one of the best of his best. 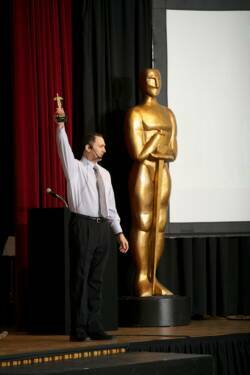 Over my 25+ years in sales/sales management and sales/customer service training, I have witnessed countless sales and customer service people that confuse activity with achievement, many on a daily basis. The fact is many sales and customer service people routinely engage in activities that keep them busy rather than focusing their efforts and attention on the behaviors that will move them forward towards greater success. They perform their going through the motions routine and have the outward appearance of lots going on but, like running on the treadmill, tomorrow they’re no father along then they are today. It reminds me of the wonder years coaching my kids soccer teams. During games, everyone would run around (lots of activity) but hardly anyone would score (achievement). At the end of the game everyone would feel like they worked their butts off and accomplished something but the score would reflect otherwise. As I often say in training, there’s a difference between activity and prosperity. What will you do today to prosper tomorrow? 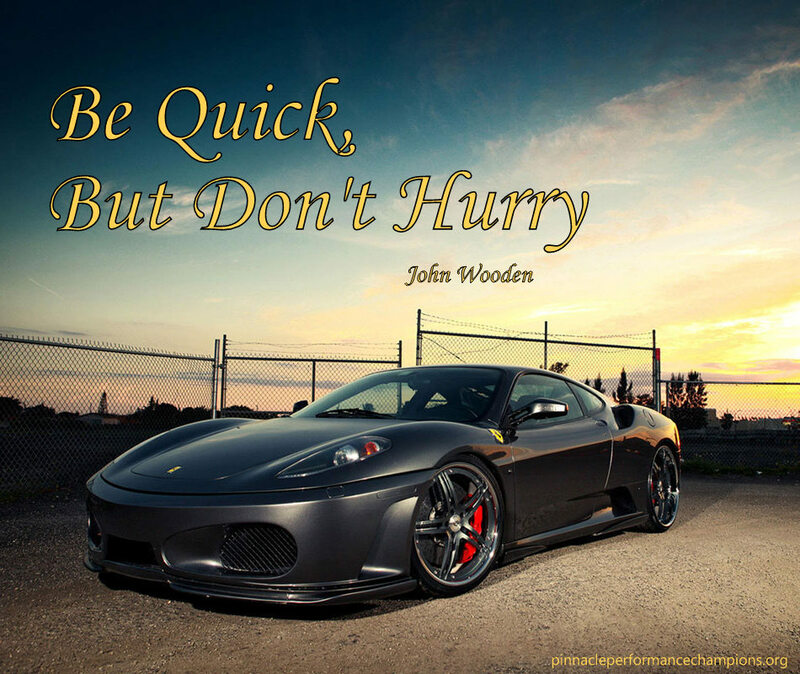 Let’s kick-off the week on a high-note with the next John Wooden Maxim; Be Quick, But Don’t Hurry. 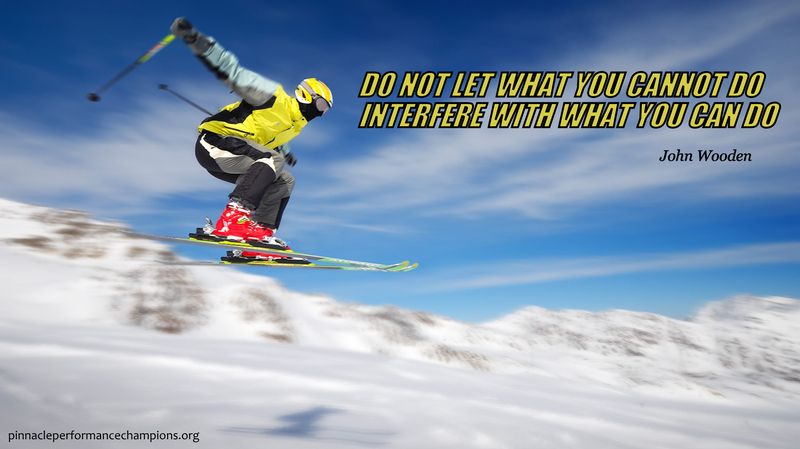 This little maxim has big meaning when it comes to maximizing your performance. Customers want you to be pro-active and “act quickly” to address their needs. They also want personal care and attention and, if you hurry this area, they won’t feel your behavior was sincere and you put the relationship at risk. World class customer service pro’s maintain proper balance; quick in service but slow in interactions with customers. So, like a supercar, you must be “Quick” and responsive when needed and also properly paced “Don’t Hurry” when called for. 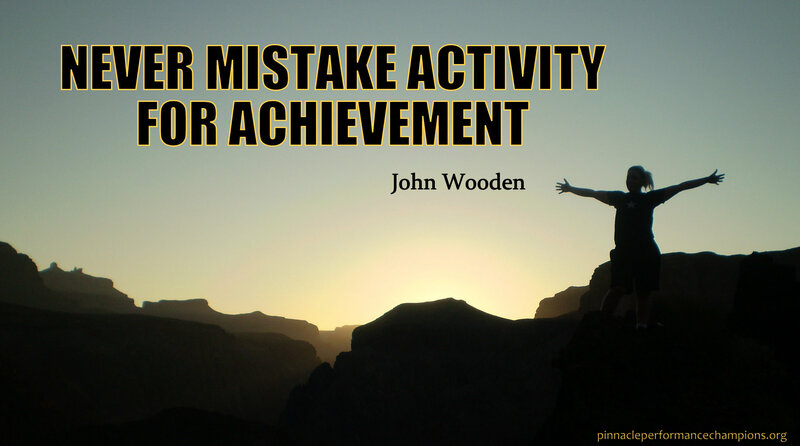 Here’s your first inspirational maxim from John Wooden, The Greatest Coach. 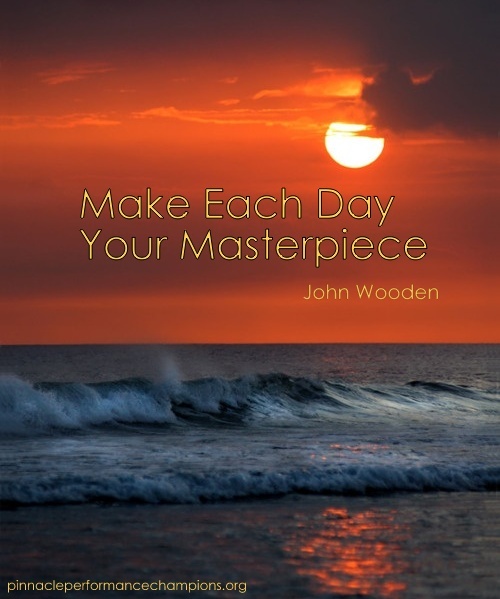 “Make Each Day Your Masterpiece” is all about the here and now. You only get one shot at maximizing today for tomorrow it’s gone. John Wooden taught his players to do the best you can each and every day. 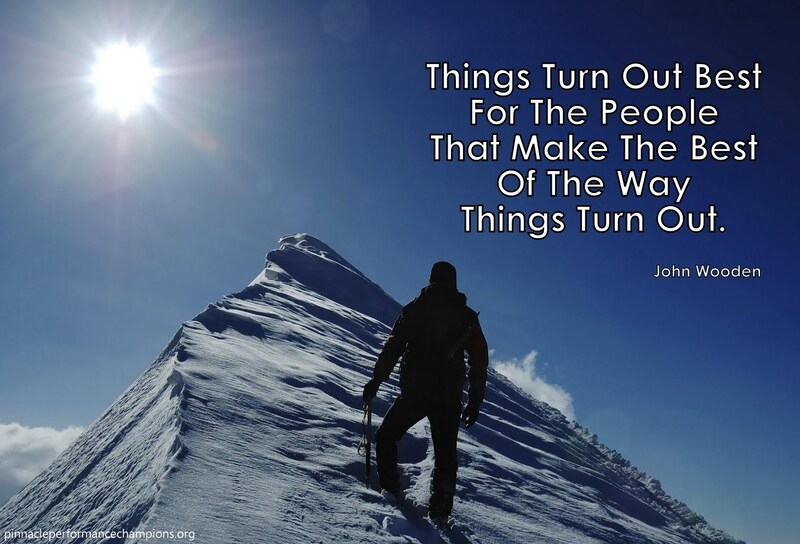 What you do (or don’t do) to prepare and improve today will shape and create your future success (or lack thereof). This ties very well into the Pinnacle Performance principle I cover in client training: Small changes over a consistent period of time equal BIG results. By applying yourself to be a little better in your behaviors and execution each day, you will become a lot better over time.